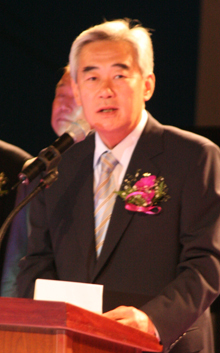 WTF President Chungwon Choue delivers congratulatory remarks during the opening ceremony of the 1st Korea Open International Taekwondo Championships at the Olympic Gymnasium II in Olympic Park in Seoul on Sept. 5, 2005. The inaugural evnet drew 636 athletes and officials from 33 countries. SEOUL (Sept. 5, 2005) — The 1st Korea Open International Taekwondo Championships kicked in Seoul on Sept. 5, 2005. The inaugural event, which will continue through Sept. 8 at the Olympic Gymnasium II in Olympic Park, drew 636 athletes and officials from 33 countries. Among the participating countries in the event, which also serves as the Pre-World Taekwondo Poomsae Championships, are Greece, South Africa, Senegal, Azerbaijan, Ukraine, Paraguay, and Austria. In his congratulatory remarks during the opening ceremony of the Korea Open at the Olympic Gymnasium II, Chungwon Choue, president of the World Taekwondo Federation, said, "The opening of the Korea Open International Taekwondo Championships is very timely in the renaissance of Taekwondo." "As the event also features poomsae, it is very meaningful for the 1st World Taekwondo Poomsae Championships scheduled for September next year in Seoul," Choue said, hoping that this event would developing into the most prestigious Taekwondo open event in Korea. Choue thanked the Taekwondo family, including grandmasters around the world, for their efforts in helping Taekwondo be included in the program of the 2012 Olympic Games. He said, "Over the next four years, the WTF targets an increase of its members from the current 179 to 202, including all the National Olympic Committees that the IOC recognizes." "I am fully confident that these efforts would help increase the number of worldwide Taekwondo practitioners from the current 60 million to 100 million or more." Jung-kil Kim, president of the Korean Olympic Committee, said in his opening address that "The main goal of this championship are to improve the general quality of Taekwondo competitions and to elevate the technical level of the players." "This first tournament will quickly grow to become the premiere international Taekwondo event. Taekwondo as a sport is very young, but that youth has not diminished the phenomenal growth of Taekwondo across the world," Kim said. "We expect this championship to demonstrate a new possibility for Taekwondo competition to continue to grow as a popular sporting event throughout the world." The Korea Taekwondo Association, the organizer of the Korea Open, said it has already decided to hold the 2nd Korea Open International Taekwondo Championships at the same venue Sept. 4-6, 2006. For more information, please contact Seok-jae Kang, director of the WTF's PR Division at 82-11-773-0241.